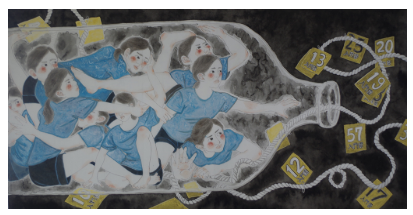 Congratulations to Advanced Art student, Melody Chang (2021) who has been selected as a finalist in the regional, Taichung 107 years Art Competition Preliminary. Both of her submissions won awards in competition with a total of 5170 works of art. 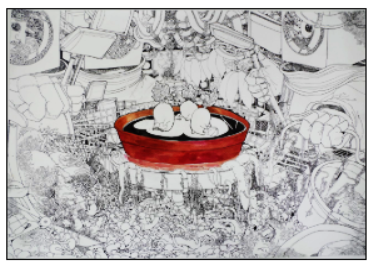 Her works include, Bottleneck, which won Third Place in the Chinese Painting category; and her ink drawing, Eliminate, won Third Place in the Comic category. In this part of the national competition, each category of submissions received three First Place, six Second Place and nine Third Place winners from 1533 selections. The art from the eighteen Taichung winners will join winners from other Taiwanese cities. In the last stage of the competition, there will be one First, Second and Third place winners selected. Winners will be announced on December 8, 2018. Melody is a prior national art competition winner in Taiwan and we wish her the best of luck for securing a second, well-deserved award for her outstanding work and effort in Art and Design!